FTP stands for File Transfer Protocol and is used to upload and download files from your hosting account. All Doteasy web hosting plans come with FTP capabilities. Connecting to FTP can be done in a few ways. You can connect to your server using an FTP client like FileZilla or CyberDuck. You can also use an HTML editor like DreamWeaver. Regardless of how you connect to your server, you will need to use the correct login credentials – which is your Doteasy Member Zone and password. However, there may be times when you need to provide FTP access to other people, but you don’t want to share your Doteasy Member Zone or cPanel logins. For example, you might want to allow a freelance photographer to upload images to your website. In this case, you can create an FTP account with restricted access to a specific folder. 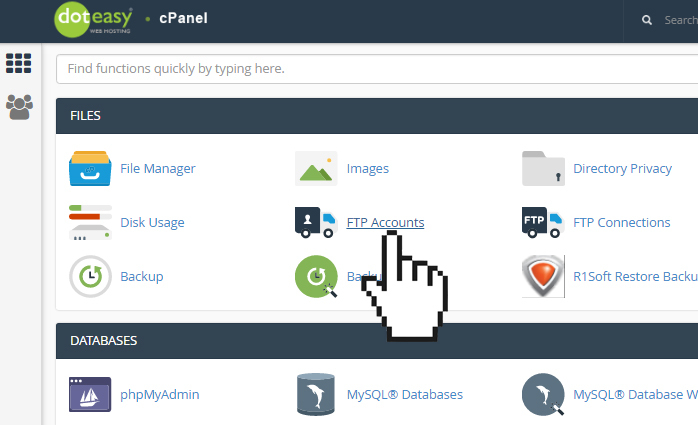 The cPanel FTP Accounts tool lets you create and manage your FTP accounts. You can define which directory the FTP account has access to, and you can alter its quota.